BuCu West commissions local artists to create public art on Morrison Road. The cowboy sleeps in Bear Valley. The Mousetrap is pretty drab. Commuter rail arrives at DIA in 2016. 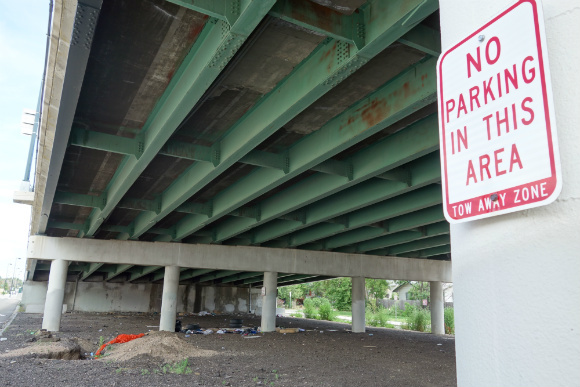 Murals are coming, but how about a troll under the Evans Avenue bridge? The old water tower is the last remnant of Gates. Public art has the capacity to inform, inspire and enliven people and places. Over and over again, an outdoor masterwork has been the engine for urban revitalization. Look around. Denver is a model city for public art, from the city's program that directs a percent of projects over $1 million into public art to plenty of businesses, nonprofits and city departments that have upped the city's aesthetics on their own dime. But it's a big canvas. The city is a work in progress, and will always be. Here's six of our favorites -- and six voids yet to be filled. Lawrence Argent's I See What You Mean has become a Denver icon and the city's most selfied work of public art. 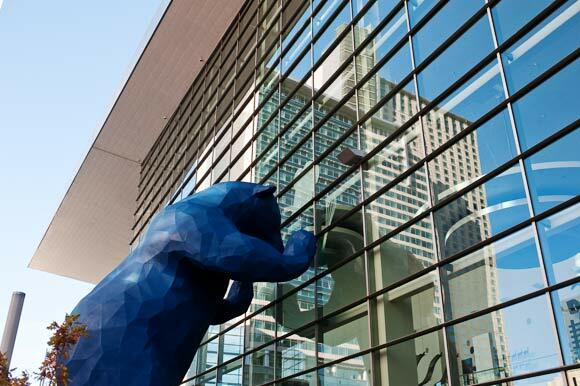 It gave the businesslike Colorado Convention Center a dose of levity when it was expanded in 2004. The 40-foot-tall, 10,000-pound azure ursine giant is the city's unofficial mascot after just a decade. The world's largest milk can is the centerpiece of the plaza that's one of the most active places in Denver. The LoHi landmark is the brainchild of developer Paul Tamburello. As its star rose, the neighborhood followed. 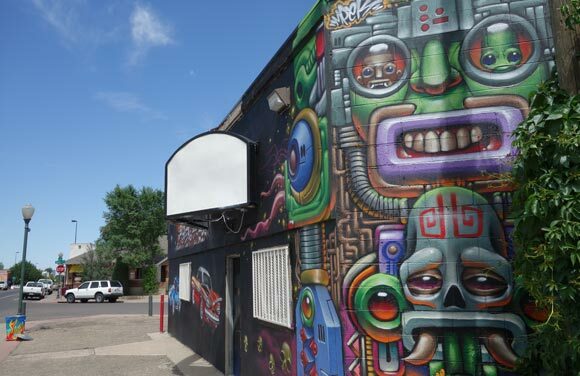 The beating heart of street art in Denver is a colorful outdoor gallery that veers from comic to political to psychedelic and back. 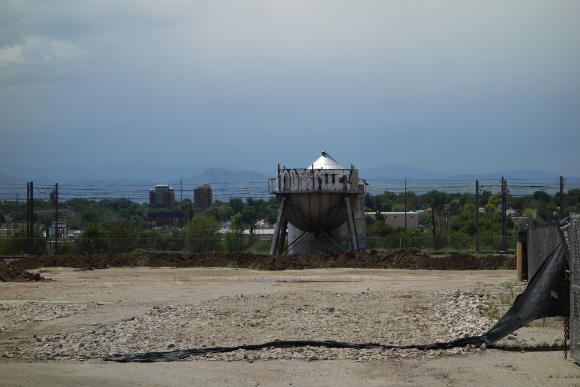 The big question: How much will dodge the wrecking ball of the ongoing development boom in RiNo? Murals dot trash cans, electric boxes, buildings and other outdoor surfaces along Morrison Road as part of an anti-tagging initiative in Westwood. BuCu West organized a campaign to artists to paint works of art, and the ensuing neighborhood ownership of the art reduces tagging. It's not hard to imagine this drag becoming the next Art District on Santa Fe. Resembling a row of New York storefronts, the remarkable high-resolution wrap cladding the Sun Valley HQ of Ink Monstr has attracted people from all over the city for a look, says owner Reed Silberman. It's the perfect example of creating a creative centerpiece to a neighborhood in transition. 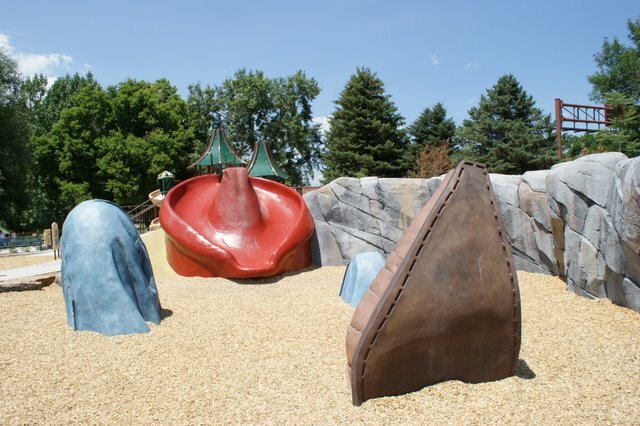 In far southwest Denver, Denver Parks & Recreation transformed a sombrero-shaped slide into a sleeping giant cowboy via knees and boots poking through the earth and equally apt for clamoring. The park upgrade included a tall tale about the Sleeping Cowboy himself as well as a wide range of interactive and educational diversions a stone's throw from Bear Creek. This is my neighborhood. I've often thought this forlorn spot, which sits next to a light-rail stop four blocks west of Broadway, could be the perfect home for a Rocky Mountain cousin to the Fremont Troll in Seattle. Maybe it can't be a troll in Denver. How about a cutthroat-trout mermaid or a gruff mountain billy goat or three? Change is coming in the form of a grant-funded mural project. Colorfully painted overpasses in El Paso and San Diego could serve as models for its creators. The world-class airport and the world-class downtown are linked by a pretty drab drive -- and soon-to-come commuter rail won't have much better views. There's an opportunity to liven up the stretch with public art that tells a story on the way -- a series of works along the route that tell new arrivals what kind of city they've just landed in. Okay, so you need to start the Denver story with DIA's scary murals and the one and only Mustang. Then artists should let their imagination run wild on the tale that could be told by a series of interrelated artworks on the trip downtown. The Mousetrap needs some visual pizzazz to mark this well-traveled spot. The functional but drab cloverleaf interchange at the crossroads of interstates 25 and 70 could use a jolt of color for the people in the 200,000-plus vehicles that navigate these ramps daily. A college professor of mine, Jim Beard, called places like this "neo-place urban realms," car-centric corridors dominated by national chains and big-box stores that look pretty much the same in Miami or Anchorage. In Denver, some bold public art could distinguish it from everyplace else. This busy intersection needs a visceral and visual symbol of a gateway, something fitting as the entry point to the Art District on Santa Fe and launchpad to the mountains. Battery621 is a good start enlivening this conduit, but what about a two-sided artwork that captured the transition from urban to alpine, and vice versa. The structures are gone and Frontier Renewal owns the property. Whether an ambitious mixed-use plan, like the one that fell apart in the wake of the Great Recession, comes to pass or not, the spot needs a landmark nod to the former use of the property, where Gates invented the modern rubber serpentine belts found under most every car hood today. The world's largest tire is in Allen Park, Michigan. 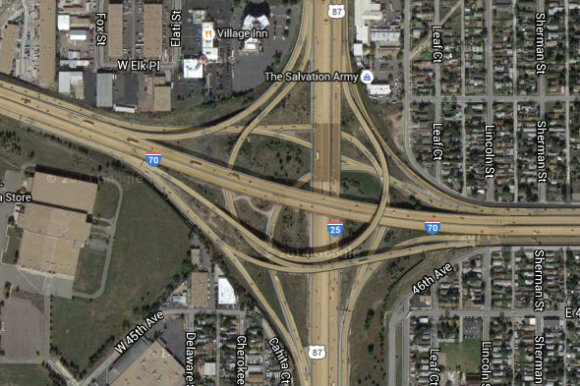 The world's largest V-belt rightfully belongs in Denver.